Build the most ergonomic, highest throughput, HPP Material Handling Equipment Solutions in the HPP Market Place. Ensure that our Solutions are designed for compatibility across all HPP Machine Manufacturers such as Avure/JBT, Hiperbaric, and Uhde. Maintain a set of universal standards for work place safety, food safety, functionality and scaleability. Our Goal: Bring affordable, functional material handling equipment to the HPP Industry. Drive the overall operational costs of HPP down by maximizing the through-put of the HPP machines and creating economies of scale. Our 6 Basket Stainless HPP carts. The initial problem was getting the product from the production line an immediately into the baskets so they could be transported to the HPP Equipment. As an initial solution, we designed stainless carts to solve the problem of loading off the production line; however, the weight of the cart and product, caused a new set of problems: Weight Restrictions and Limited Floor Space. Therefore, we redesigned the carts into HDPE 6 Basket Stackable Pallets; thus dramatically reducing the weight while increasing the amount of pallets and pounds of product shipped. As a result, we lowered production cost to a Fraction of the Cost of the stainless steel and dramatically increased the amount of product shipped. How can you consistently hit your cycle goals without jeopardizing your pounds processed and thus meet your customer expectations while having a team that doesn’t have to work weekends and extra shifts? Let me explain, Become more Predictable by Controlling the Events you can Control. 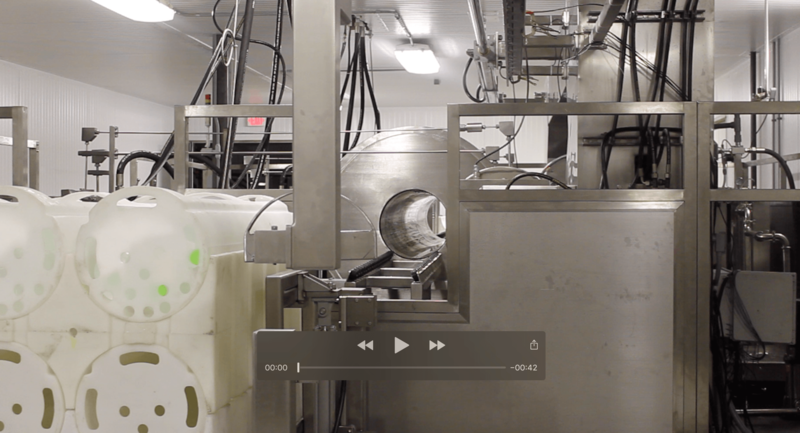 We recognize that the Packaging for High Pressure Pasteurization directly affects the material handling process and thus must be accounted for in the design of the material handling systems. Packaging can slow down the filling of the HPP basket loading equipment of the baskets on the front side and become a bottleneck for HPP basket unloading equipment on the process side. As a result, we stress the need to evaluate the entire process on the onset of a project and incorporate buffering zones for work in progress (WIP). Send Us an Email Today and Lets get Started on Increasing your HPP Thorough-Put!